A shooting outside Church bar reportedly claimed the life of 32-year-old Mitchell Mormon, Jr. and left Shaunita Walker injured Saturday, November 12, 2016. 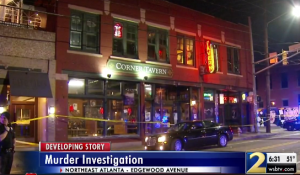 According to WSBTV 2, gunfire erupted following a dispute “outside of the Church bar on Edgewood Avenue.” Mr. Mormon, a father of three young children, was apparently celebrating a new job when he was struck and killed. A second victim, Shaunita Walker, was also struck during the hail of gunfire. She was reportedly transported to the hospital with a gunshot wound to the arm, per WSBTV reports. Her current condition has not been released.